"This is not the first room like this that I've sat in." Finance Minister Bill Morneau holds a news conference after meeting with business leaders in Gatineau, Quebec, on Sept. 20, 2017. 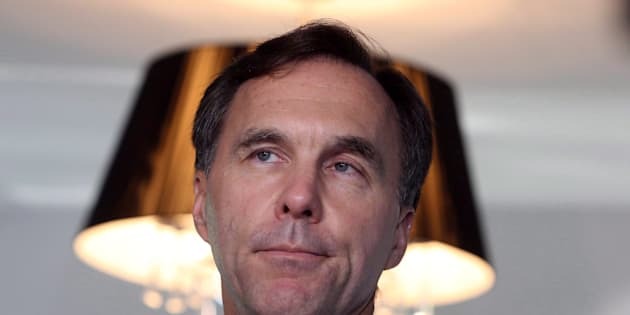 OTTAWA — Canada's finance minister got a grilling Friday from taxpayers who are boiling mad about the Liberal government's proposed tax changes for small businesses. Bill Morneau was in Oakville, Ont., for a town hall meeting where a question-and-answer session boiled over more than once into a shouting match. Some were bellowing at Morneau to answer their questions, while others tried to shout them down to let the minister talk. All the while, Morneau's fellow cabinet minister, Karina Gould, tried to maintain calm even as time was wrapping up with several people still lined up at microphones, anxious to give the finance minister a piece of their minds. Morneau sat silently near the end of hour-long session as person after person approached the microphones in the room to argue against the measures. "This is not the first room like this that I've sat in," he said at the start of his closing remarks. He brought up one question that stood out to him about what the government planned to do next, only to be asked by more than one person to answer it directly, once and for all. "Just to be clear, I'm trying to say what we're focused on. I'm certainly not going to address the tax policy issues that we may consider after that. You can't do that. "You wouldn't expect us to come to policy decisions on the fly," he said, at which point the uproar began anew, and Gould had to ask the audience to let Morneau finish. The Liberals have faced heated opposition to their plan ever since Morneau unveiled the proposed changes over the summer, with questions from within the Liberal caucus. The rhetoric has become even more heated in recent days as the Opposition Conservatives have linked the changes to Morneau's family company, Morneau Shepell, which offers individual pension plans. One expert told the Commons finance committee those kind of plans could become more appealing if the tax proposals are implemented as-is. Morneau brushed off the questions about his family business, which he helped run before entering politics. "I expect that when people have a strongly held point of view, they'll use multiple tactics to try and make that point of view heard. That's what it means to be a politician." Morneau has been waging a public relations to reassure different sectors of the country concerned at how the changes would affect them. On Thursday, he said technical fixes were in the works to address farmers' concerns that the changes would impair their ability to bequeath the family farm to the next generation. During the Oakville meeting, Morneau told the audience the changes would only apply "on a go-forward basis" and that the Liberals would "protect what's been done in the past." Speaking afterwards, Morneau said the government's messaging on the proposed changes has turned into a game of broken telephone. Many people seem to be focused on changes to things like income sprinkling and passive investments — strategies that probably don't apply to them because they are used by only a small subset of tax filers, he said. "We've just been unable to get through the message that we want to keep small business tax rates low, that people could be looking at only some advantages that are available to only a very small subset of pretty wealthy Canadian controlled private corporations and concerned that impacts everyone." Conservative finance critic Pierre Poilievre called the town hall meeting a "rendezvous with reality" for Morneau. Poilievre summarized what he heard from the meeting: Morneau's "plan will not only pick their pockets, but screw up their life plans." Morneau isn't ready to say what, if any, changes the Liberals will make to the proposal — only that he will keep listening to Canadians. The issue will be on the agenda next week when Prime Minister Justin Trudeau meets with his provincial counterparts.